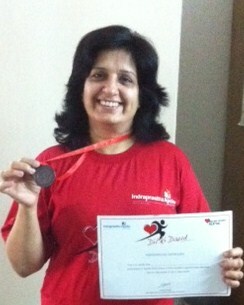 I participated in a mini marathon, campaign against heart disease organized by Indraprastha Apollo hospitals, New Delhi, India. 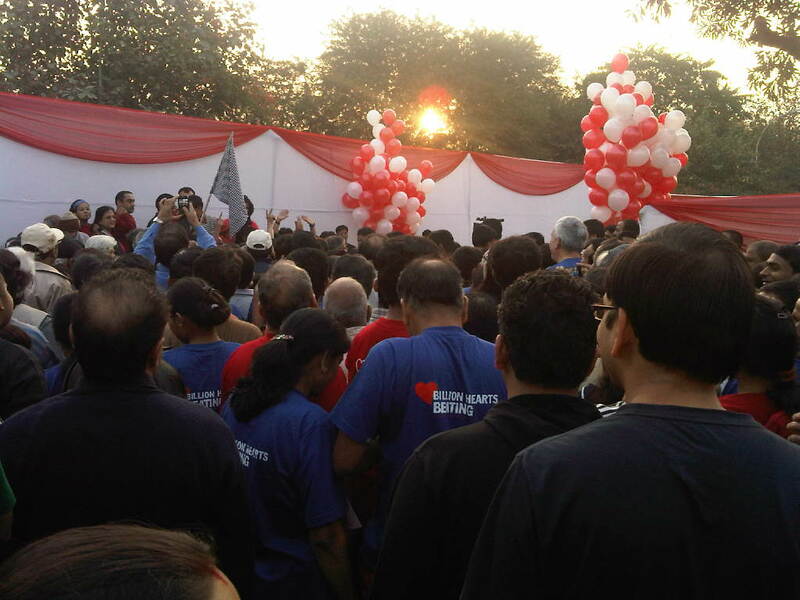 When I reached the hospital grounds on 4th December, sunday morning at 6.30 a m, it was packed with people of all ages and sizes. 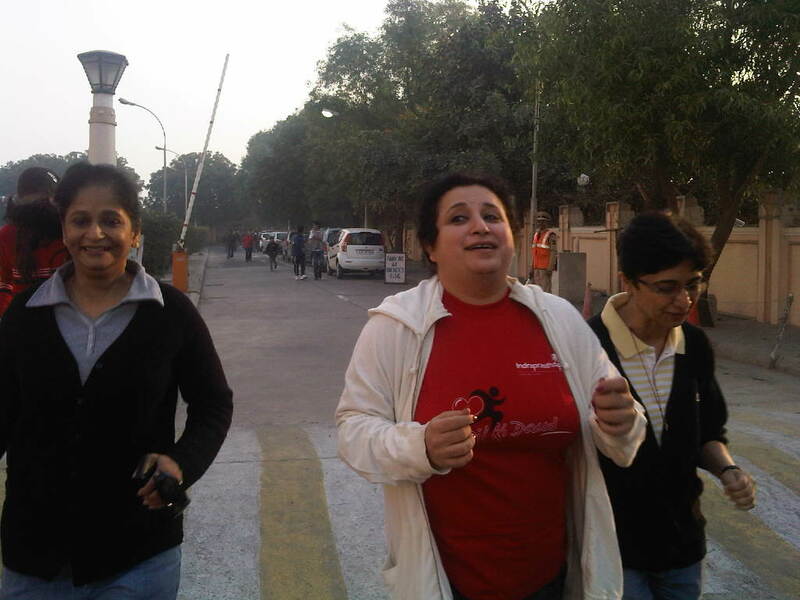 I was comforted to see women in my size too, all geared up to participate in this healthy heart marathon. Early mornings are pretty foggy and cold here in Delhi but surprisingly, it was just perfect and pleasant. I had to take my jacket off mid-way through my 3 km walk/run. 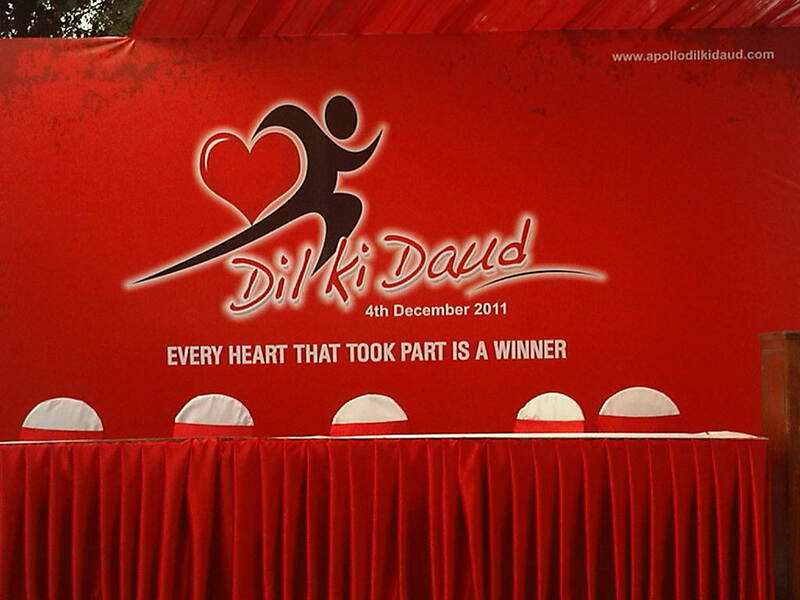 The runners were given t shirts in three colors, Red, Blue and Black, with Dil ki Daud printed on them, this gave us all a sense of uniformity and a collective cause to run for. We felt connected to each other and everybody was smiling at each other and wishing good luck for the race. There were balloons at the start line and they were released when the race was started at 7.30 a m.
It was heartening to see senior citizens proudly displaying their badge numbers and wearing their T shirts, the light in their eyes was rivaling the sun’s brightness that Sunday morning and I was humbled and honored to be in their esteemed and dignified company. I thought of my father and how much he used to enjoy his walks and his contribution to society. He was a member of Dignity foundation( senior citizen’s group) in Mumbai and was always the first one at the start line for any sporting event. I miss him a lot but felt that he was around that day and was with me every step of the way. I met a lot of interesting people and made a few friends before the run, there were doctors, teachers, home-engineers( like me) and women pursuing other professions. It was a great day to be outside and to be a part of such a noble and worthy cause. Heart health is very important at any age, and spreading awareness about this cause made us proud and happy to be out there. 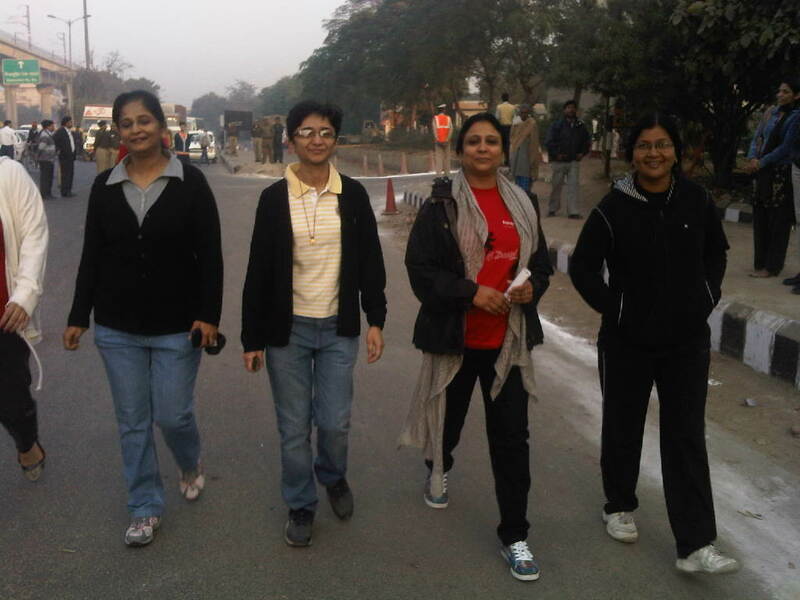 We walked in a group and chatted like we’d known each other since ages, though it was the first time I had met these lovely, intelligent ladies. I made quite a few friends and realized that we all are basically the same, all of us go through the same emotional roller-coaster and survive the ups and downs, in our own way. All of us have our own personal challenges and we all emerge victorious sooner or later, life is nothing short of exciting and every step forward is a small win. It was heartening to see the enthusiasm of the participants and before the run it was announced that there would be no prize money but only participation certificates and medals. 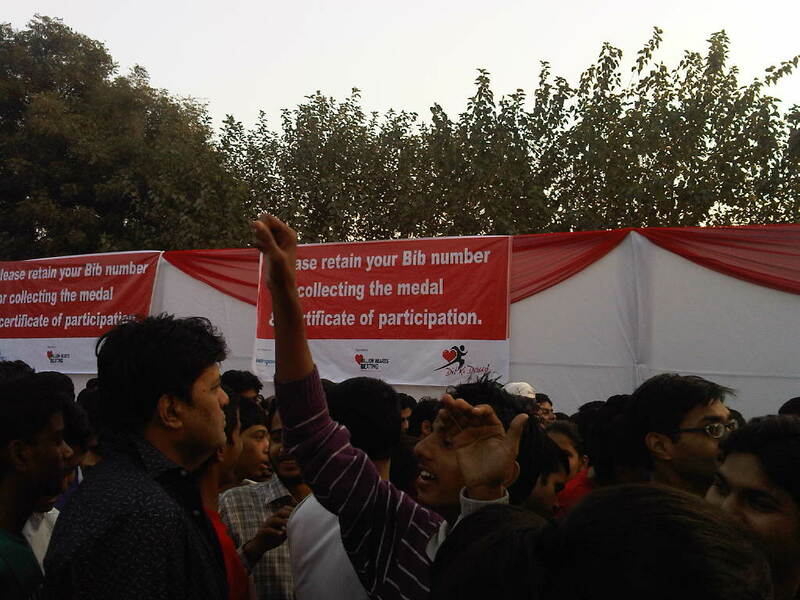 The mini marathon began and people started running, the route was well marked and the event was so well organized that there was no confusion. There were water bottles, fruits and Lemon juice at various places along the route. 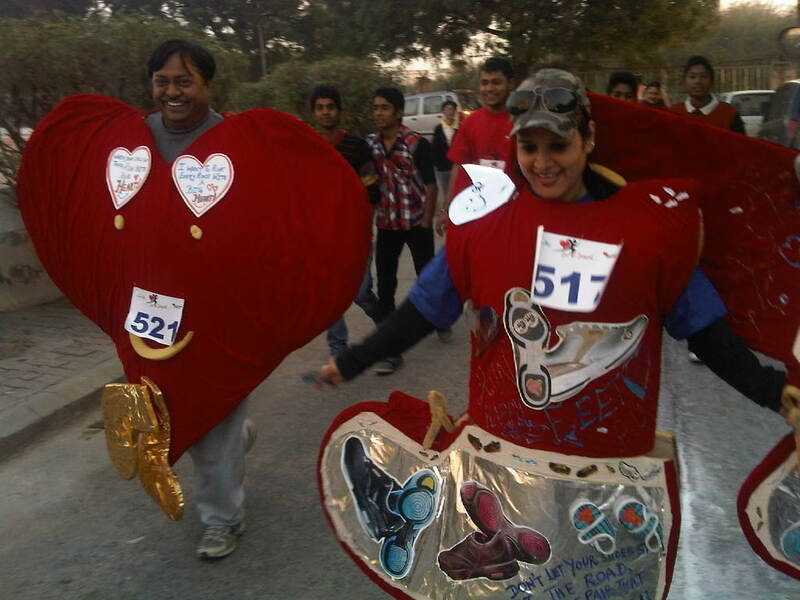 There was a man dressed up like a giant heart and a lady as a shoe. They walked together and looked adorable. 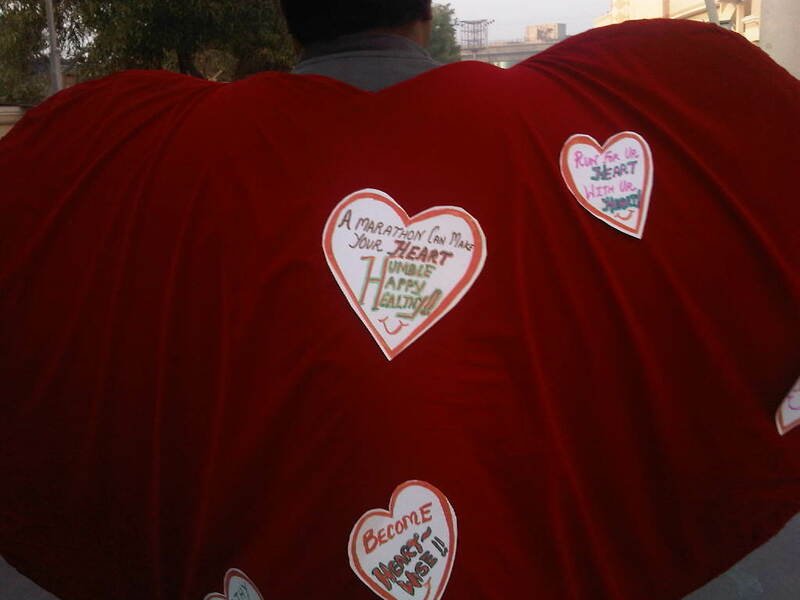 I like the messages written on the heart and tried to click a picture of the giant heart walking in front of me. 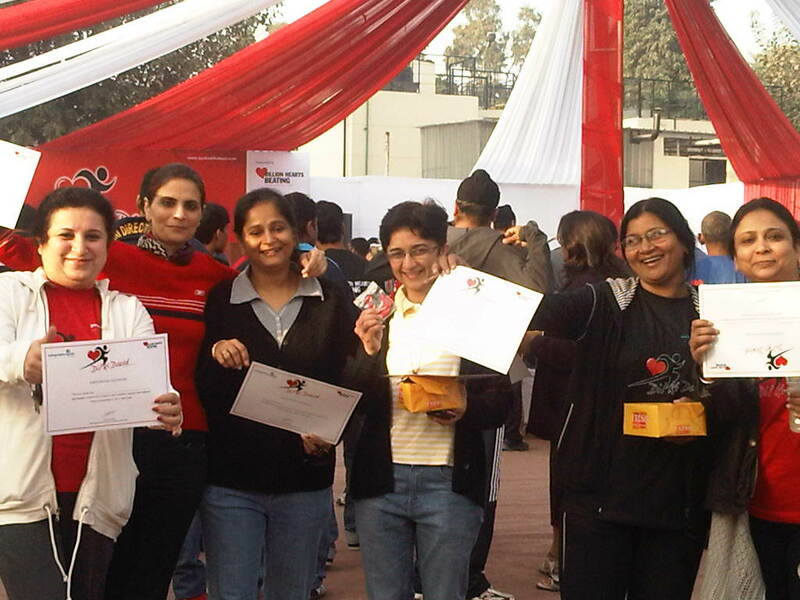 At the end of the 3 km race we were awarded our certificates and medals and a box of refreshments. The hospital grounds resembled an outdoor park with people sitting on the chairs and enjoying their fruit and juice while exchanging pleasantries with each other. My new found friends were ecstatic on receiving their medals and certificates. And so was I 🙂 I only wish, I had kept my eyes open for the picture. It shows I am not as fit as I claim to be, I was relieved to have finished the marathon, as my son had challenged me to do so. He had said something which stuck in my head and heart, ” Mom, finish the run, no matter what”. I had to complete the marathon or risk seeing the accusation in his eyes. The things we mothers do for our kids!!! It was the most fun I did on a Sunday and I felt a sense of accomplishment after reaching back. It was my tiny effort to give back to society, something My father always believed in and also doing my bit for keeping my heart healthy and spreading awareness in the society. Happy walking and keep smiling. Congrats you finished the marathon. So heartening to see that people are becoming more aware towards their health. A good cause and a wonderful way to make people aware. Kudos. Janaki, we both are committed to causes dear to our hearts. I lost my dad to heart disease and am partial to this initiative. Thanks for your lovely comment. Congratulations Sulekha…So proud of you…Thanks a lot for sharing this experience of yours with us. Alpana, thanks a lot. I had a great time and really enjoyed myself. Very nice! We Brits are facing problem of obesity and all that comes in its wake. But still people are reluctant to leave their laziness and now winter is coming handy for them for being further lazy! When I go for an early morning-jog in the park there's hardly anybody to give me company. We really need to have such marathons here too. Portia, we all are becoming unhealthy and protecting our hearts has become very important.Thanks for visiting. Yeah! The things that we do for kids n the challenges that they set for us…it goes to show how much they trust us n believe that we can do it. Belina, thanks for the visit and your comment. We encourage and support each other, kids become our coaches and we their under trainees. Abhisek, thank you so much for visiting my site and appreciating my post. 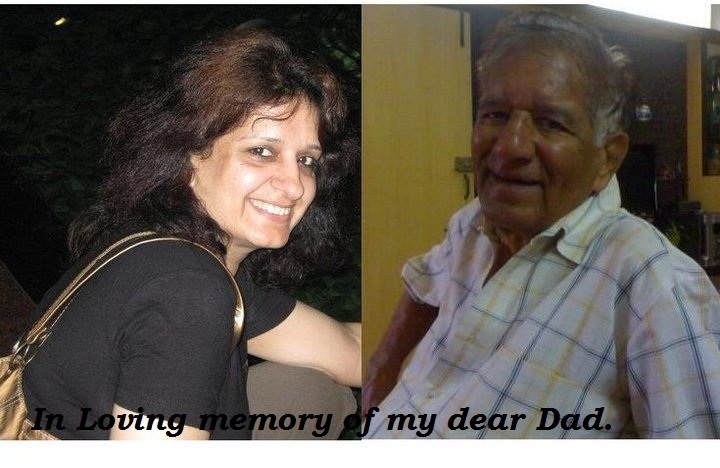 I am my father\’s daughter and am proud to be his torch-bearer. Rimy, I had to be there not only for my sake and my dad's but also for everyone who has ever lost a loved one to heart disease. Thank you for your love and encouragement, Outlier. Jan, my family is my personal cheering squad and my fans 🙂 love them a lot and making them proud is my wish. Thank you for visiting and commenting. I am sorry for the loss of your father. Please accept my condolences. You are very fortunate to have had so many years with your dad. My own father died when I was a young teenager & he never had the chance to see me grow to become the man I am today. The memory of him fades with each passing year, but there are some things I remember that will live in my heart as long as there is life left in me. When you love your heart, you are also loving you, for the heart is the life force within us. Sulekha, I am so proud of you & you too should be proud of yourself. Doesn't matter if you had to run or walk, you made it past the finish line. Congratulations to you & everyone else. You are doing something truly special. I love that last photo of you too. Your smile says it all! Andy, thank you for your kind words. I was very lucky and am so glad I had my dad with me to celebrate all major events in my life but I couldn't fulfill his dream of seeing my name on the back cover of a book. He was the president of my fan club and is cheering for me from up there too 🙂 when I do write a book hope he sends me a sign saying, I am proud of my daughter. Ineltlingece and simplicity – easy to understand how you think. And you’ve made some friends along with a big heart and a shoe lol…loved it! Melissa, thanks…it was a campaign against heart disease. This is quite an achievement at your age:) proud of you. Good for you! I can't even run a mile!! (asthma and I've been lazy recently) But, I swear I'm going to get out walking again soon. Rachel, please do start walking, it's good for your health 🙂 thank you for visiting and commenting. Karl, thanks a lot for your comment. Cath, thanks a ton for visiting and commenting. Cath, Thanks a ton for visiting and commenting on my article. My father would be ecstatic that his daughter is following in his footsteps. So proud of you S!! way to go…I ran a race with by 7 year old this year. Depsite the fact that he finished way ahead of me, i enjoyed it thoroughly. you are right, the things we do for our kids eh? Love the new look, btw. Thank you so much S 🙂 Kids make us dance to their tunes and we love it. I figured why not have my own dot.com so I registered my domain name and hosted my website 🙂 Thanks for visiting and commenting. Well done-very heartening for "not so fit" moms like me…there's hope. Piu, welcome to my site and thank you for your lovely comment. 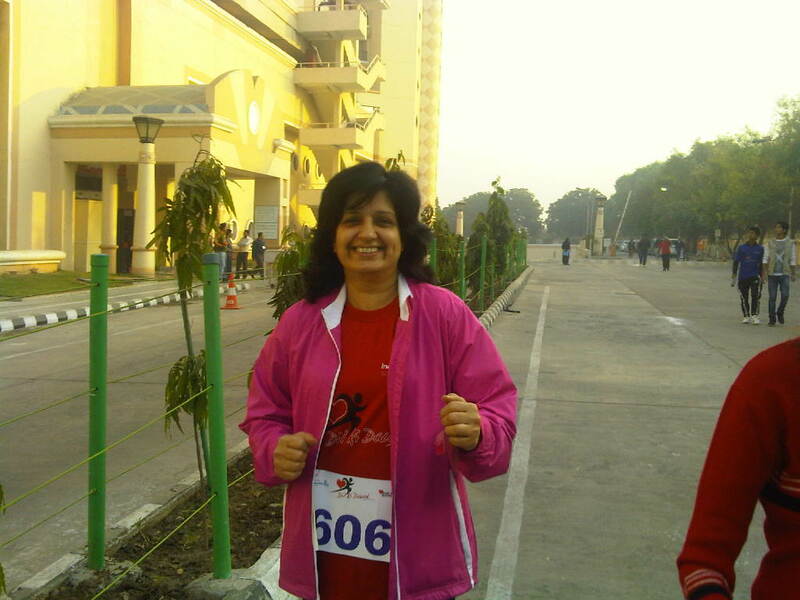 Well done sulekha, you finished the race that was more important. I remember kartik has been your motivator ever since our NWWA days, always ready to open the prizes you won. Stay healthy and get ready for more runs. Ritu, welcome to my website and thanks for your compliment. How did I miss this!! 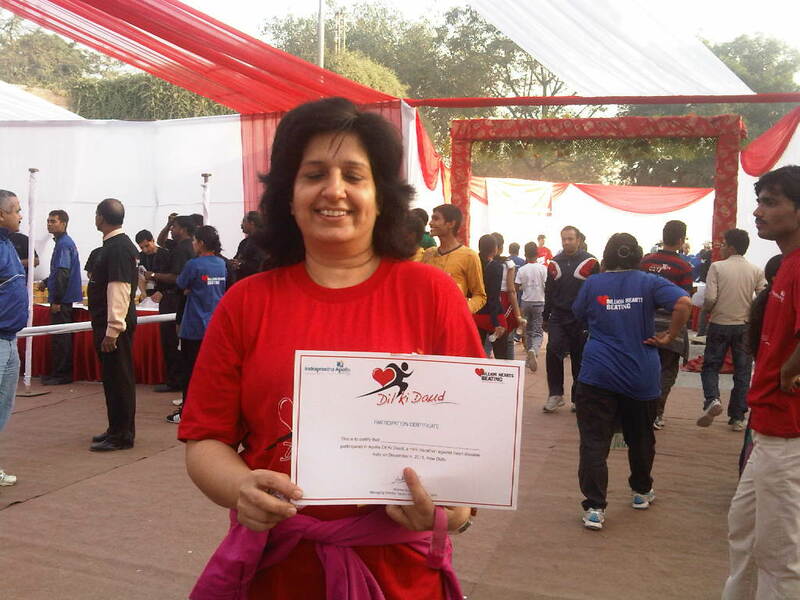 So proud of you, Sulekha….Dil Ka Daud indeed!